The Royal American Regiment was founded on James Prevost’s idea that a corps of foreign-speaking immigrants already in America could be raised. To entice German-speaking immigrants in America, Prevost, a Swiss mercenary looking for a command in the British Army, spent the final three months of 1755 in mainland Europe recruiting nearly 100 officers and noncommissioned officers who spoke numerous languages. By March 9, 1756, resolutions had passed to approve the final formation of the regiment, and the officers would arrive in New York to start training and recruiting by mid-June 1756.Although Prevost thought he would be in charge of this entire regiment, he was instead placed in command of only the fourth battalion. Since it was war time and the corps was raised simultaneous to 10 other regiments, they did not utilize an approved lace design for their coats. Since they were a “Royal” regiment, the facings for their coats were blue. The first contract for clothing for the entire regiment was filled by Galfridius Mann, whose family ran a prominent army contracting business. The first shipment of clothing was sent on May 4, 1756 and cost close to £12,000. Along with many other things, the manifest included “3600 Centinels coats and breeches” costing one pound, four shillings, and six pence each. Yearly, enlisted men were issued one new hat and a pair of wool breeches. Their old coats were cut down to make their new waistcoats. Upon receiving the clothing, it was sent to the regimental tailors for fitting, and when the tailors were finished, the clothing was issued to the regiment. 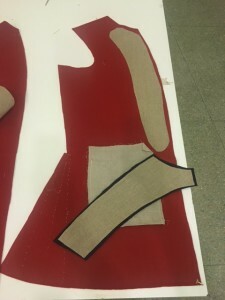 The following is a general overview for constructing a Royal American coat. This is part one of a three-part series. 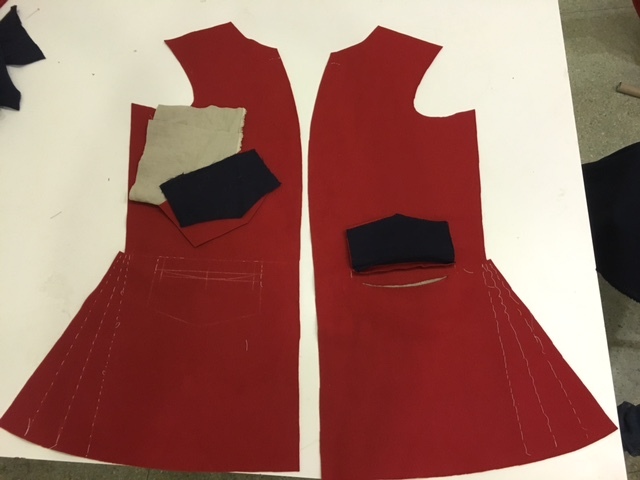 Materials for the coat were purchased from Roy Najecki of Rhode Island and consist of about 2 1/4 yards of Kochan and Phillips Madder Red Broadcloth, 2 yards of Royal Blue Bay, 1/3 yards of Royal Blue Broadcloth, some linen Buckram, and a natural linen for sleeve linings and pocket bags. The pattern is chalked on to the fabric, which has been folded in half width-wise. 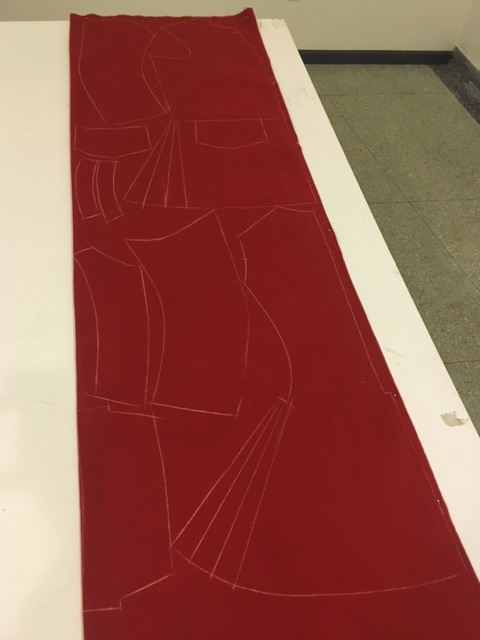 The pattern was purchased from Henry Cooke of Historical Costume Services and will fit a man with a 42” chest. 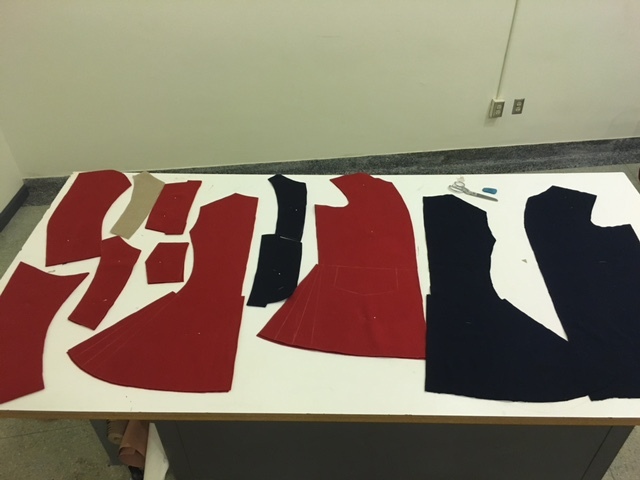 All the pieces are cut and pinned together with their opposite pieces. Lapel, pocket, and pleat fold positions have been chalked on the front panels in the center of the picture with more pleat fold lines chalked on the back panels. Tailor tacks are then sewn onto the panels on the respective chalk lines. The tailor tacks are cut and the panels separated. The pocket flap lining is attached and the top edge of the pocket is pressed down and attached. A slit has been cut open for the pocket bag. The bottom edge of the slit is pressed down and the pocket bag is attached. The chest interfacing is attached to the front panels as well as the facing lapels. The hooks and eyes have also been set into the skirt tails. 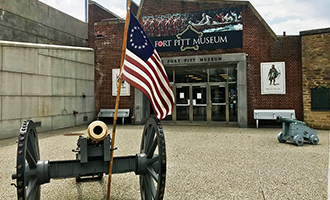 Justin Meinert is the living history program coordinator at the Fort Pitt Museum.